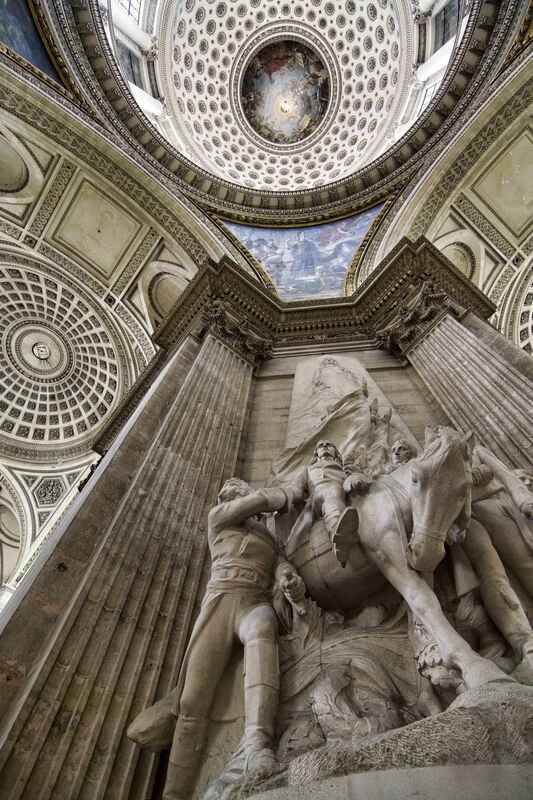 The Panthéon '(temple) to all the gods') is a building in the Latin Quarter in Paris. 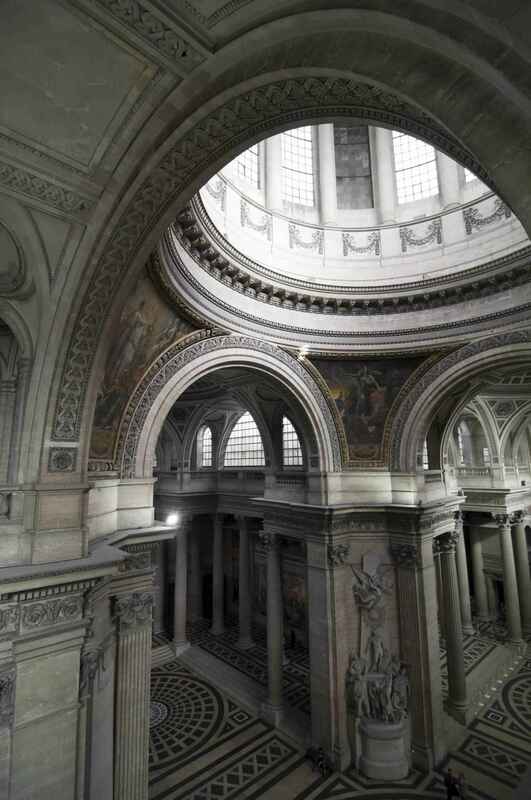 It was originally built as a church dedicated to St. Genevieve and to house the reliquary châsse containing her relics but, after many changes, now functions as a secular mausoleum containing the remains of distinguished French citizens. It is an early example of neoclassicism, with a façade modeled on the Pantheon in Rome, surmounted by a dome that owes some of its character to Bramante's Tempietto. Located in the 5th arrondissement on the Montagne Sainte-Geneviève, the Panthéon looks out over all of Paris. Designer Jacques-Germain Soufflot had the intention of combining the lightness and brightness of the Gothic cathedral with classical principles, but its role as a mausoleum required the great Gothic windows to be blocked. The inscription above the entrance reads AUX GRANDS HOMMES LA PATRIE RECONNAISSANTE . By burying its great people in the Panthéon, the nation acknowledges the honour it received from them. As such, interment here is severely restricted and is allowed only by a parliamentary act for "National Heroes". Similar high honours exist in Les Invalides for historical military leaders such as Napoléon, Turenne and Vauban. Among those buried in its necropolis are Voltaire, Rousseau, Victor Hugo, Émile Zola, Jean Moulin, Louis Braille, Jean Jaurès and Soufflot, its architect. In 1907 Marcellin Berthelot was buried with his wife Mme Sophie Berthelot, the first woman to be interred.Marie Curie was the first woman interred based on her own merits.Geneviève de Gaulle-Anthonioz and Germaine Tillion, heroines of the French resistance, were interred in 2015.